← Does Church Size Matter? In 2009, Michael Bell, posted a most interesting article on the average church size in America. What would you guess is the average size? 300, 500, 750? Imagine you are looking down a very, very long street, and all the churches of U.S. are lined up along the left side of the street from smallest to largest. In behind each church are all their Sunday morning attenders. If you counted the grand total of everyone standing behind each church and then divided this number by the total number of churches that you see on this very long street, you would come up with a “mean” or “average” size of 184. “Mean” is usually what we mean of when we think of “average”. But this number of 184 is a very misleading number. Lets say you start walking down the street, passing the churches with 5 people on a Sunday morning, 10 people, 15 people, 20 people. You continue walking until you have passed half of all the churches in America. Half of the churches in the U.S. are now behind you, half are still in front. The “average” church that you are standing in front of is called the “median” church. You look to see how many people are lined up behind it, and you see 75 people. That is right, half the churches in the United States have less than 75 people. I am interested in posting Bell’s thoughts because of an article I recently posted on whether church size matters. I think these numbers above are quite telling. The average people population (the ‘mean’) of a given local church in North America is that of 184 people. Or, you might come at it from the perspective that says half of the churches in America have 75 people or less (the ‘median’). That’s what I am understanding from these statistics. So, you continue walking, past the churches of 80, 90, 100, 110. You walk until you have passed 90% of all the churches. You look to your left and you see 350 people lined up behind this church. Much to your surprise, although you have passed 90% of all the churches, over half of the churchgoers are still in front of you! This is why the “mean” is so much higher than the “median”. 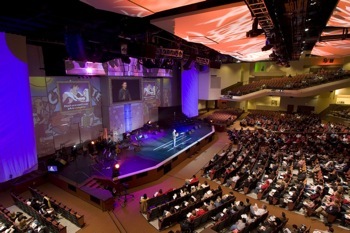 While most of the churches in the United States are small, most of the attenders go to large churches. So, though half of the churches in the US have 75 people of less, with 90% of the churches having 350 people or less, still, half of the individual church-goers are part of churches that have more than 350 people. Yes, we like it large-sized, venti-sized. I personally appreciate churches in the 75 to 184 person range. As I have said a few times, I am convinced that we need more and more to extend outwards, not upwards. This entry was tagged church, church size. Bookmark the permalink. This is facinating. I wonder how this is changing over time. I once heard someone say that ‘small is the new big’. I would also be interested to know how attendance relates to membership. For instance how does the number that turn up to various gatherings relate to the number in the church directory? But this might be harder to measure and vary greatly with the type of church. Thanks Scott, I’m about to read the other article you referenced. This was very good. I am not sure small is ‘new’. I would think it has always been like that, and even more in the past. Only in the last few decades have megachurches (or churches larger than a few hundred) been such a phenomenon. As to how this relates to actual membership, that would be a good discussion and study. It’s ok to ‘attend’ a Sunday morning gathering with no commitment. Yes, the other article is good to read, though it has a bunch of statistics. Thanks for drawing attention to my article again. What I am hoping to do soon, is look at the relation of church size to baptisms. That is, trying to ask the question: Are certain sizes of churches more effective in conversion growth than others? I will try and keep you posted. Yes, that would be good. But I suppose that would be even more difficult to pen down, especially considering that people are considering ‘alternative’ (I am not sure I like that word to describe this) methods of church. So we will walk into the normal Baptist or charismatic or Methodist church to survey the numbers. What about effective house churches, gatherings of God’s people (as an ekklesia) in a cafe, etc, etc? Just wondering about it all. But we know numbers are never 100% effective. Thanks for the information. As a licensed clinical psychologist (PhD) and pastor of a local congregation, I have had to “encourage myself, my wife, my kids, and our congregation” to stay the course. You see, we are a very small congregation of about 90 people (and I am counting our babies to pad the numbers; it makes me feel better, sorry!!). Not too far from us, about 8 miles is a megachurch. Quite frankly, they’ve got it going on … best contemporary Christian music in town; best basketball gym, best kiddy programs (as ‘jealous’ as I am about their kiddy program, I must admit, it is the bomb!). While even though I know better cognitively and spiritually, partas of me struggle with the psychology of feeling inferiorized by this megachurch (the inferior feeling is on me not them). But whenever I choose to sneak in for a visit with them to enjoy one of their ‘fantabulous’ Christmas specials, I am blown away, I mean blown away. I leave feeling happy, blessed, confused, miserable, and pitiful (for me). For crying out loud, what is wrong with my approach? If I dance, we attract about 80 in attendance on a good Sunday; if I really bring the ‘word’ and have a ketchy topic (after all, I am a psychologist, right? ), we see an attendance between 100-125 which is over the top for us. But that ‘kool tear-up Jeans-wearing’ megachurch down the road from us, is killing me, killing me. I don’t have a prayer against them. Anyway, God bless them for their great work in the community. I wish I could be invited to preach for them at least once but not likely (?). They seem to find their brother and sister megachurch leaders to fill that role. By the way, I plan to sneak in again this year to check out their Christmas special. Just wish I could borrow a ‘couple a three’ of their highly gifted and talented musicians and singers once in a while. With my truly awesome and authentic drummer-daughter … and with me as steady Eddy on my rhythm guitar (and Trace TA 300 Amp); three of their 50 something musicians could do a lot for us. Hey, we all could still dream, right? I just read your post and about how much you really “admire” the megachurch down the street…. I must say too that they ARE impressive. However, I must point out that the statistics of some of the megachurches aren’t good. Their turnover in attendance isn’t indicative of true membership or participants, but occassional viewers… and Christ didn’t call anyone to sit on the sidelines. Are they flashy, “kewl”, and a “rockin’ hip place to be”? Maybe… but are they an outlet where people’s lives are changed and souls are getting saved? Keep preaching the Word, not the popular topic or viewpoint, and you may only have a handful of people at your side, but you will be doing what God commanded us to do. You may not have the flashy Easter production or the oscar winning Christmas performance with Lawrence Olivier playing a guest role, but remember that while they may be performing for the people, you are performing for the king. And if the King’s happy with what He hears… we’ll it don’t really matter about everyone else now does it. Thank you, my brother. Your words of encouragement are very helpful. Just saw the above post … I am writing a book that had to deal with church size. What I discovered was it is not the size of your church that matters, but the healthy of an average small group of your church. Are your leaders trained? Are they held accountable? Are they focused? Etc.. Anyway, I think the smaller churches more resemble the early church model. Therefore I think your smaller church models a better model! Tom Wheeler. I just want to commend you for your work! The bottom line is when we meet Jesus face to face we want to all hear “Well done thou, Good and Faithful Servant!” If you were led by the Spirit of God to pastor your church, then He has you there for a reason and it really doesn’t matter what any other church in your area is doing. We are all in it to together! I happen to be a Children’s Pastor of one of those megachurches. I’ve been serving there for over 23 years and I can say what I learned in Bible College was true…”How do you spell ministry? W.O.R.K.” Along with the numbers comes responsibility. God gifts us, enables us, and anoints us differently. After a couple of failed attempts at pastoring, our founding pastors prayed and God instructed them to begin a work in an extremely impoverished, gang-infested, inner city area (one of the top 20th most deadly cities in the country). The purpose was simply to bring the gospel (good news) to those in need of a savior. No denomination to back them financially, no TV shows, no famous writers on board, just a love and desire to share the Gospel. They began supplying a need with food, clothing, etc. and made friends with the leaders in the community. They purposed, we would always give them an opportunity to accept Jesus as Lord. So we do. We cry with them, teach them the best we can, we help them get off the street and live productive lives. But not everyone, Neal, can do that and put up with all of the drama that sometimes accompanies a church this size. We have a regular membership of about 17,000 members (about 10,000 of whom attend each week). I have the privilege to have about 2500-2800 children a week attend classes I oversee. Our actions have been misunderstood through the years, sometimes fueled simply by jealousy. I’ve been rewarded through the years for sure, but my first ministry job was a teen minister of a small church in the San Francisco Bay area. I became their “dad” and taught them basics of life they weren’t getting, even got them out of “themselves” and on short term missions trips. Now, 30 years later, they are all in ministry, some pastoring, some just volunteering, and still stay in touch with me. Again, keep up the good work and keep your eyes on the vision God gave YOU! Our small church failed…. well, technically we merged into a slightly larger church. We were averaging about 50 people a week (counting babies to pad the numbers, too!). The official REASON for ending it all was “running out of funds” but the truth is – people were tired of trying. (I wasn’t, but I, like Neal, felt confused, miserable, and pitiful). I don’t want praise or recognition – I just want to see the lost saved and the community reached for our Lord. The church we merged into had about 100 each week. The merger is 3.5 years old and settled with about 20 of those from our original smaller church. They had the building. I was NOT full time. Now, the dream in my heart hasn’t died. I am excited about the mega churches AS LONG AS they preach the truth regarding the fundamentals of the faith and encourage people to seek and find God and Biblical principles. Yet, in my heart, I want to see the church I am with grow into a large, effective ministry, touching the lives of thousands for the Kingdom. Is there something wrong with my desire? Is there something wrong with me? I do pray that faith does not completely disappear from the United States. The worlds “new atheist” have almost completely conquered our large public Universities (I work at one of them) but Jesus did say that the road was narrow. So, Like you Neal, I don’t want to be jealous – if anything, I want to see both small and large churches thrive. Pingback: How much should a church pastor get paid? The early church was an organic, ever-changing number related to “who met in who’s house.” When administrators and bureaucracy took over, the church became an institution with early power but little supernatural power…and so the nature of “the biblical based church” was lost in a mire of worldliness and extra-biblical traditions. The sad fact is that it has had to come to this point for some to be jolted alive, to realize that there is a better way and it is possible to live in the system of a New testament church. These churches- where they exist- defy numbers. Like the underground church in China, they are not bound by traditions of men or women, so are free to meet as the spirit leads- and yes, not forsaking meeting together. This church has been called The organic church, the simple church, and the like, but the truth is that it defies trendy labels. And that is a good thing. For more information, check out our brothers and sisters at thelastreformation.com. It seems entirely possible to me that approximately half the population is more comfortable and connected in a smaller congregation and the other half prefers a large congregation. If you’re going to have enough small churches for the small-church-preferring half of the population, you’re going to have a lot more small churches than you have mega churches. People are different. One way doesn’t have to be better than another. The question is whether faithful ministry is being done in sustainable ways. The thing to keep in mind to is that post moderinists aren’t settling on one church as their home but are choosing a church weekly based on their needs. Now that probably throws of some numbers. We were just having our church staff meeting and came across your post. Thank you very much. Added a lot of great insight. Hey Scott, im a pastor and this was such a great article! Hey Mike. You can view some data at this link: http://www.soc.duke.edu/natcong/Docs/NCSII_report_final.pdf. That data is about 8 years old now, but probably not too terribly off. As a pastor of a small country church, I agree with some of the comments above. It is hard to not compare your church to a mega-church. I have found that small churches have something that big churches can never have, and that is 1) the ability to allow, demand in fact, that the congregation share their gifts with their brothers and sisters, and 2) the feeling of close family (of course there is a danger there as well). I just recently told a visitor that we try to be close, but not so tight-knit so that nobody can get in. We occasionally use the slogan, “itty bitty church, Great Big God.” I think it fits.